Pacific Angler would like to invite you to the sale event of the year. 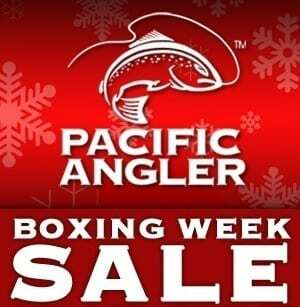 This is truly the Fisherman’s Boxing Week Sale! From Tuesday, December 26 to Sunday, December 31 Pacific Angler will be offering once a year savings that you do not want to miss! There are amazing savings starting at 10% and going up to 50% so you are sure to get some great gear at the years best prices! Pacific Angler will have extended hours on December 26 from 9AM to 7PM. Our normal business hours will resume December 27. Take a good look at the list below to see all the amazing deals. There are some phenomenal savings to take advantage of on rods, reels, lines, waders, boots, jackets, freshwater gear, saltwater gear, fly fishing, Spey fishing, sunglasses and accessories. This list goes on and on and on. From expert to beginner, we have something for you and at the best price of the year. So come down, get geared up, and save money! Deals on all your favorite brands like Simms, Sage, G. Loomis, Orvis, Redington, Rio, Fishpond, OPST, SA, Airflo, Fenwick, Shimano, Daiwa, Abu Garcia, Abel, Islander, 3-TAND, Lamson, Grundens, Gibbs Delta, Oki, Pesca, Scotty, P-Line, and more! Minimum 10% off all items in stock and some items up to 50% OFF. Some exclusions may apply on downriggers and trap pullers. Discontinued Rio and SA Fly Lines up to 40% OFF! Assortment of Fly Tying Materials 40% OFF. Saltwater Spoon “Wall of Savings” with select spoons 30% OFF. Buy a fly rod, reel and line combo, valued over $500 and get a 1 hour personal casting lesson for free! Buy any fly rod, reel & line combo and receive a 15% discount! Purchase any levelwind rod & reel combo over $300.00, and receive free line along with any applicable discounts! Purchase a float tube & fins and receive a 15% discount! Note: Combo Specials discounts can not be added to items already on sale or discounted. Spey & Switch Rods Minimum 10% OFF! We have a full selection of Sage, Redington, and G. Loomis Spey and switch rods. If you are just getting started out or need that one last rod to complete your collection, now is your chance to save as these current 2017/2018 rod models rarely go on sale. Fly Rods Minimum 10% OFF! From 3 WT to 12 WT, from beginner to advanced, fresh or salt, we have the rod for your needs and they are on sale! This is your chance to save on 2017/2018 rod models that seldom get discounted. Path 590-4 Regular $180 now 30% OFF! Path 690-4 Regular $180 now 30% OFF! Path 790-4 Regular $180 now 30% OFF! Path 796-4 Regular $180 now 30% OFF! Crosswater 590-4 Regular $130.00 now 30% OFF! Crosswater 690-5 Regular $130.00 now 30% OFF! Crosswater 890-4 Regular $130.00 now 30% OFF! TFO Signature Series II 8 foot, 4 weight, 2 piece. Great Skagit rod. Regular $169.99 now 40% OFF! Amundson Coast Rider 9 foot, 6 weight, 2 piece, comes with tube. Amundson Coast Rider 9 foot 4 weight, 2 piece, comes with tube. All Sage, Redington, Abel, Lamson, Hardy, Nautilus, 3 Tand, Islander and Okuma Fly Reels, min. 10% OFF! We have a wide variety of Sage reels in stock from trout to Spey, freshwater to warmwater, 2 weight to 12 weight. Save on these great brand name reels, 10% OFF! 1 only Sage 4650 Reel, regular $520.00 now 40% OFF! 1 only Sage 3230 Reel, regular $240.00 now 40% OFF! Limited quantities Redington Surge 7/8/9 Reel, regular $110.00 now 40% OFF! Too Many Lines to List, Come down and check out the 40% Off Bin! Custom built Sage rods and G. Loomis E6X & IMX float rods in stock! We have a full selection of spin rods, float fishing rods, and mooching rods. Get a new stick at a great price, too many models to list! Select Rapala Salmon & Steelhead Float Fishing Rods 40% OFF! Rapala RSG106TRML2 salmon & steelhead float fishing rod. 10’6” medium/light action, trigger grip, 8-17 lb line rating. Rapala NCSS30TR North Coast salmon & steelhead float fishing rod. 10’6” medium, trigger grip, 8-14 lb line rating. Reg $199.99 now 40% OFF! Rapala CL30TR Classic Float salmon & steelhead float fishing rod. 11’ medium action, trigger grip, 6-12 lb line rating. Reg $259.99 now 40% OFF! Rapala ST65TR112M2 Shift salmon & steelhead float fishing rod. 11’2” medium action, trigger grip, 8-14 lb line rating. Reg $329.99 now 40% OFF! Select Rapala Boat Rods 40% OFF! Rapala RSG RSC660SJM1 boat rod or jigging rod. 6’6” medium action, 30-80 lb line rating. Reg $149.99 now 40% OFF! 6’6” medium action. Great combo for bass fishing! Reg $159.99 now 20% OFF! All Shimano levelwind reels 10% OFF! All Abu Garcia levelwind reels 10% OFF! All Daiwa levelwind and spin reels 10% OFF! All Penn levlewind and spin reels 10% OFF! All Centerpin Reels 10% OFF! We have Kingpin, John Milner, Islander, Raven, Okuma, Rapala in stock! Save on your dream centerpin – these reels rarely go on sale! All Okuma levelwind reels and spinning reels 20% OFF! We have lots of different models in stock for salmon, sturgeon, halibut, and trout! Trophy Tyee QR Mooching Reel on sale for $269.99! Regular price $369.99. Sale price $269.99! Gold and Slate in stock. While supplies last! Great savings on this popular mooching reel! Rapala Classic Mooching Reel on sale for $229.99! Regular price $399.99. Sale price $229.99 while supplies last! Abel Mooching Reels 10% OFF! Custom colour reels with silver handles and drag knob. Come check out the new reel design for 2018. Islander MR3 & TR3 Mooching Reels 10% OFF! Save on this west coast classic! We have black, silver, blue, and gold in stock for MR3 and Silver with red accents for the TR3. Shimano 4000 GT Mooching Reel 10% OFF! Tried and true at a great price. Regular $129.99 now 10% OFF! Daiwa M-One Plus Mooching Reel 10% OFF! Proven design for a great deal. Regular $99.99 now 10% OFF! The largest selection of Simms waders, boots, jackets, layering pieces, and accessories in Vancouver. This is your chance to get geared up in premium gear at great savings! All Simms Product is Minimum 10% OFF! Select 2016/17 items have some changes for the upcoming 2018 season and are now deeply discounted. Sometimes all that has changed is the colour! Made in USA. Blue and Slate in stock. Reg $249.99, 40% OFF! Colour Fury Orange, Size Medium, Reg $579.99, 40% OFF! 1 only. LL 12-13 and ML, 1 of each in stock, Reg $599.99, 40% OFF! Size 13 in stock, Reg $334.99, 40% OFF! 1 only. Size 13, Reg $239.99, 40% OFF! 2 only. Vibram in Size 13, 12, 8. Felt in Size 9. Reg $179.99, 30% OFF! Colour Sand, Size Large, Reg $129.99, 40% OFF! 1 only. Colour Khaki, Size Large, Reg $199.99, 40% OFF! 1 only. Colour Olive, 1 Medium and 1 Large in stock, Reg $199.99, 40% OFF! Colour Loden, Size Medium, Reg $229.99, 40% OFF! 1 only. Simms Assorted Shirts, 20% OFF while supplies last! Assorted short sleeve Tees, Reg $24.95-$34.95, 30% OFF! Simms Rogue Fleece Hoodies, 20% OFF assorted colours and sizes! There is just too much to list, so come down and take a look! Stay warm and dry out on the ocean, lake and river with Grundens rain gear. We have a variety of jackets and bib pants to keep you comfortable in the west coast weather. 10% OFF all Grundens jackets and bib pants! All bags, vests, hip packs, and backpacks 10% – 15% OFF! Huge selection from brands like Simms, Fishpond, Sage, Shimano, and Trophy. All Flies 15% OFF! Vancouver’s largest selection of flies for trout, salmon, steelhead, bonefish, permit, tarpon. All Materials and Hooks 15% OFF! Come check out our huge selection of materials and hooks for your favorite flies. Select Dr. Slick Tools 20% OFF! 50% OFF Bin with selected fly tying materials! All Rio, Airflo, Seaguar, Leaders & Tippet 10% OFF! All Freshwater Gear minimum 10% OFF! 50% OFF discount bins with lures, mono lines, braided lines and more! Saltwater Spoon “Wall of Savings” with spoons 30% OFF. 50% OFF discount bins with saltwater lures and accessories. No discounts on Scotty downriggers & trap pullers. No discounts on Ace Line Hauler trap pullers. The ultimate personal watercraft. This boat is perfect for drifting local rivers or for remote trips up north. Regular $1,399.99 on sale for $1,259.95 ! This boat is durable, compact, and lightweight. It also boasts a 5 year warranty. You won’t need it, we use them all the time and they are amazing! Sale prices are for in-stock items only. All sales are final, no returns, refunds, exchanges or credits on any items purchased from Dec 26-Dec 31 2017.